Perhaps one of the most common questions we get is what the difference is between calorie restriction and fasting. Many calorie enthusiasts say that fasting works, but only because it restricts calories. In essence, they are saying that only the average matters, not the frequency. But, of course, the truth is nothing of its kind. So, let’s deal with this thorny problem. The weather in Death Valley, California should be perfect with a yearly average temperature is 25 Celsius. Yet, most residents would hardly call the temperature idyllic. Summers are scorching hot, and winters are uncomfortably cold. You can easily drown crossing a river that, on average, is only 2 feet deep. If most of the river is 1 foot deep and one section is 10 feet deep, then you will not safely cross. Jumping off a 1 foot wall 1000 times is far different than jumping off a 1000-foot wall once. 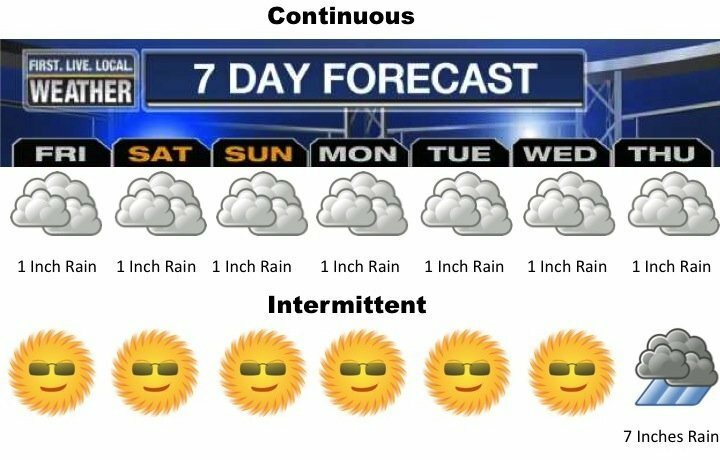 In a week’s weather, there is a huge difference between having 7 grey, drizzling days with 1 inch of rain each and having 6 sunny, gorgeous days with 1 day of heavy thundershowers. It’s obvious in all these examples that overall averages only tell one part of the tale, and often, understanding frequency is paramount. So why would we assume that reducing 300 calories per day over 1 week is the same as reducing 2100 calories over a single day? The difference between the two is the knife-edge between success and failure. The portion control strategy of constant caloric reduction is the most common dietary approach recommended by nutritional authorities for both weight loss and type 2 diabetes. Advocates suggest that reducing daily caloric consumption by 500 calories will trigger weight loss of approximately one pound of fat per week. The American Diabetes Association’s main dietary recommendation suggests to “focus on diet, physical activity, and behavioral strategies to achieve a 500–750 kcal/day energy deficit.” The ‘portion control’ advice to reduce calories has been fairly standard since the 1970s. This reduction is average calories should be spread consistently throughout the day, rather than all at once. Dieticians often counsel patients to eat four, five or six times a day. There are calorie labels on restaurant meals, packaged food, and beverages. There are charts for calorie counting, calorie counting apps, and hundreds of calorie counting books. Even with all this, success is as rare as humility in a grizzly bear. After all, who hasn’t tried to portion control strategy of weight loss. Does it work? Just about never. Data from the United Kingdom indicate that conventional advice succeeds in 1 in 210 obese men and 1 in 124 obese women (4). That is a failure rate of 99.5%, and that number is even worse for morbid obesity. So, whatever else you may believe, constant caloric reduction does NOT work. This is an empirically proven fact. Worse, it has also been proven in the bitter tears of a million believers. But why doesn’t it work? For the same reason the contestants of The Biggest Loser could not keep their weight off – metabolic slowdown. The Biggest Loser is a long running American TV reality show that pits obese contestants against one another in a bid to lose the most weight. The weight loss regimen is a calorie-restricted diet calculated to be approximately 70% of their energy requirements, typically 1200-1500 calories per day. This is combined with an intensive exercise regimen typically far in excess of two hours daily. This is the classic ‘Eat Less, Move More’ approach endorsed by all the nutritional authorities, which is why The Biggest Loser diet scores third on the 2015 USA Today’s ranking of best weight loss diets. And, it does work, in the short term. The average weight loss that season was 127 pounds over 6 months. Does it work long-term? Season two’s contestant Suzanne Mendonca said it best when she stated that there is never a reunion show because “We’re all fat again”. Their Resting Metabolic Rates (RMR), the energy needed to keep the heart pumping, the lungs breathing, your brain thinking, your kidneys detoxing etc., drops like a piano out of a 20 story building. Over six months, their basal metabolism dropped by an average of 789 calories. Simply stated, they burning 789 calories less per day every day. As metabolism drops, weight loss plateaus. Caloric reduction has forced the body has shut down in order to match the lowered caloric intake. Once expenditure drops below intake, you start the even more familiar weight regain. Ba Bam! Weight is regained despite dietary compliance with the caloric restriction and even as your friends and family silently accuse you of cheating on your diet. Goodbye reunion show. Even after six years, the metabolic rate does not recover . All of this is completely predictable. This metabolic slowdown has been scientifically proven for over 50 years. In the 1950s Dr. Ancel Key’s famous Minnesota Starvation Study placed volunteers on a ‘semi-starvation’ diet of 1500 calories per day. This represented a 30% caloric reduction from their previous diet. In response, their basal metabolic rate dropped about 30%. They felt cold, tired, and hungry. When they resumed their typical diet, all their weight came right back. Caloric restriction diets only work in the short-term, before basal metabolism falls in response. This is sometimes called ‘starvation mode’. Daily calorie restriction fails because it unerringly put you into metabolic slowdown. It’s a guarantee. Reversing type 2 diabetes relies upon burning off the body’s excess glucose, so the daily calorie-restricted diet will not work. The secret to long-term weight loss is to maintain your basal metabolism. What doesn’t put you into starvation mode? Actual starvation! Or at least the controlled version, intermittent fasting. Fasting triggers numerous hormonal adaptations that do NOT happen with simple caloric reduction. 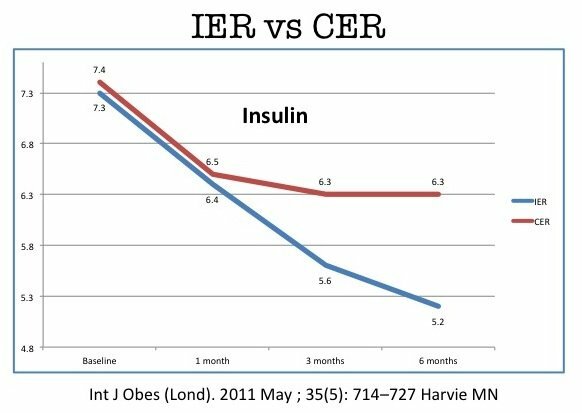 Insulin drops precipitously, helping prevent insulin resistance. Noradrenalin rises, keeping metabolism high. Growth hormone rises, maintaining lean mass. Over four days of continuous fasting, basal metabolism does not drop. Instead, it increased by 12%. Neither did exercise capacity, as measured by the VO2, decrease, but is instead maintained. In another study, twenty-two days of alternate daily fasting also does not result in any decrease in RMR. Why does this happen? Imagine we are cavemen. It’s winter and food is scarce. If our bodies go into ‘starvation mode’, then we would become lethargic, with no energy to go out and find food. Each day the situation gets worse and eventually we die. Nice. The human species would have become extinct long ago if our bodies slow down each time we didn’t eat for a few hours. No, instead, during fasting, the body opens up its ample supply of stored food – body fat! Yeah! Basal metabolism stays high, and instead we change fuel sources from food, to stored food (or body fat). Now we have enough energy to go out and hunt some woolly mammoth. During fasting, we first burn glycogen stored in the liver. When that is finished, we use body fat. Oh, hey, good news – there’s plenty of fat stored here. Burn, baby burn. Since there is plenty of fuel, there is no reason for basal metabolism to drop. And that’s the difference between long-term weight loss, and a lifetime of despair. That’s the knife edge between success and failure. Fasting is effective where simple caloric reduction is not. What is the difference? Obesity is a hormonal, not a caloric imbalance. Fasting provides beneficial hormonal changes that happen during fasting are entirely prevented by the constant intake of food. It is the intermittency of the fasting that makes it so much more effective. The beneficial hormonal adaptations that occur during fasting are completely different from simple calorie restriction. The reduction of insulin and insulin resistance in intermittent fasting plays a key role. The phenomenon of resistance depends not only upon hyperinsulinemia, but also upon the persistence of those elevated levels. The intermittent nature of fasting helps to prevent the development of insulin resistance. Keeping insulin levels low for extended periods of time prevents the resistance. Studies have directly compared daily caloric restriction with intermittent fasting, while keeping weekly calorie intake similar. A 30% fat, Mediterranean style diet with constant daily caloric restriction was compared to the same diet with severe restriction of calories on two days of the week. Over six months, weight and body fat loss did not differ. But there were important hormonal differences between the two strategies. Insulin levels, the key driver of insulin resistance and obesity in the longer term, was initially reduced on a calorie restriction but soon plateaued. However, during intermittent fasting, insulin levels continued to drop significantly. This leads to improved insulin sensitivity with fasting only, despite similar total caloric intake. Since type 2 diabetes is a disease of hyperinsulinemia and insulin resistance, the intermittent fasting strategy will succeed where caloric restriction will not. It is the intermittency of the diet that makes it effective. Recently, a second trial directly compared zero-calorie alternate-day fasting and daily caloric restriction in obese adults. The Caloric Reduction as Primary (CRaP) strategy was designed to subtract 400 calories per day from the estimated energy requirements of participants. The ADF group ate normally on eating days, but ate zero calories every other day. The study lasted 24 weeks. The other big concern is that fasting will ‘burn muscle’. Some opponents claim (without any evidence) that you lost 1/4 pound of muscle for every single day of fasting you do. Considering I fast at least 2 days a week, and have done so for years, I estimate my muscle percentage should be just about 0%, and I shouldn’t even have enough muscle to type these words. Funny how that didn’t happen. But anyway, what happened in that study? The CRaP group lost statistically significant amounts of lean mass, but not the IF group. Yes, there is LESS lean muscle loss. Maybe it has to do with all the growth hormone and nor adrenalin being pumped out. 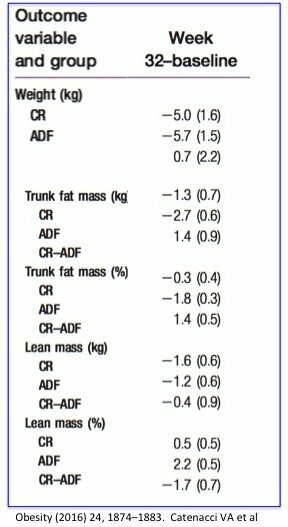 Lean mass % increased by 2.2% with fasting and only 0.5% with CRaP. In other words, fasting is 4 times better at preserving lean mass. So much of that old ‘fasting burns the muscle’. What happens to basal metabolism? that’s what determines long term success. If you look at the change in Resting Metabolic Rate (RMR). Using CRaP, basal metabolism dropped by 76 calories per day. Using fasting, it only dropped 29 calories per day (which is not statistically significant compared to baseline). In other words, daily caloric reduction causes almost 2 1/2 times as much metabolic slowdown as fasting! So much for that old ‘Fasting puts you into starvation mode’. Fasting has been used throughout human history as a tremendously effective method of controlling obesity. By contrast, the portion control strategy of daily caloric restriction has only been recommended for the last 50 years with stunning failure. Yet, conventional advice to reduce a few calories every day persists and fasting is continually belittled as an outdated, dangerous practice akin to blood-letting and voodoo. The study reports that “Importantly, ADF was not associated with an increased risk for weight regain”. Holy S***. That’s the Holy Grail, Man! The whole problem is obesity and The Biggest Loser is WEIGHT REGAIN, not initial weight loss. Weight regain differed during fasting vs CRaP. The fasting group tended to regain lean mass and continue to lose fat, while CRaP group gained both fat and lean mass. Part of the issue was that the fasting group reported that they often continued to fast even after the study was done. Of course! It is easier than they though, with better results. Only an idiot would stop. One of the very fascinating things is that ghrelin (the hunger hormone) goes up with CRaP but does NOT during fasting. We’ve known forever that dieting makes you hungrier. It’s not a matter of willpower – it’s a hormonal fact of life – the ghrelin goes up and you are hungrier. However, fasting does not increase hunger. Fascinating. No wonder it’s easier to keep the weight off! You’re less hungry. Calorie restriction diets ignore the biological principle of homeostasis – the body’s ability to adapt to changing environments. Your eyes adjust whether you are in a dark room or bright sunlight. Your ears adjust if you are in a loud airport or a quiet house. The same applies to weight loss. Your body adapts to a constant diet by slowing metabolism. Successful dieting requires an intermittent strategy, not a constant one. Restricting some foods all the time (portion control) differs from restricting all foods some of the time (intermittent fasting). This is the crucial difference between failure and success. Intermittent Fasting: More weight loss, more lean mass gain, more visceral fat loss, less hunger, been used throughout human history, lower insulin, less insulin resistance. Almost every medical society, doctor, dietician and mainstream media will tell you to use choice #1. I prefer to tell people to take choice #2. Not answering for Jason here of course. But interested to know what you typical meals look like for a day/week? What sort of food do you eat? You say you exercise regularly, what does that look like? Sleep and stress? Good or not so good? I would suggest you start to eat more as 1500 cals a day with an active lifestyle is far from ideal. There’s a strong possibilty you’re suffering from a broken metabolism. I would up my cals to 2000 a day minimum and stop the excessive 48hr fasts. You should start to feel more energetic and your sleep should improve. Just found this amazing website! I’ve been on LCHF with 18 hr IF for about 4 months, significant weight loss, but not really seen a significant change in hunger level at the 18 hr IF mark. Is my RMR suppose to slowly drop, and should I be seeing (or will see) a reduction in 18 hr IF hunger level going forward? Maybe too much carbs in your single meal stimulates your insulin to not drop. Do a fasting insulin test. Lower carbs and be careful with proteins, no more than 0.7 g protein per kg of lean weight, measure again after 3 months both weight, waist and fasting insulin. Read dietdoctor.com and look up what Ron Rosedale says about too much proteins. Best of Luck! Oi Ana, your diet looks poor in zinc at least. It is possibly not rich enough in fat and collagen, which can be remedied with bone broth, beef and butter. You may also try to see what it is like to have two meals one day, and zero meals another day. It is also possible that you are losing fat but building muscle, and that results in zero weight loss. What you need to monitor is not your weight but your waist circumference. I don’t believe in ‘broken metabolism’. You are still living your life, you consume and burn energy everyday. Just something in your diet is out of control. You may need to track your calories more accurate (so easy to go wrong here). And for breaking your plateau you may try prolonged fasting for more then 10 days. As you have experience with 48 hours fasting you will not have any problem with that. Only your fear can stop you from doing it. But please don’t worry, it’s safe. You can google it and find out for yourself. Ana, it seems to me that you are mixing up several weight loss methods. You are fasting, doing keto, exercising and counting your calories. Why in the world would you count your calories ? My feeling is that you are STARVING. Eating one meal a day is excellent but you have to eat enough. 1500 kcal is definitely not enough and therefore your metabolism is shutting down. Stop counting calories and add many more fat to your meals ! Hi! I am a bit perplexed. When Dr Fung talks about caloric restriction, isn’t 16/8 IF that I do everyday, 7 days a week like if I would do a calorie restricted diet ? I don’t count calories at all, I am careful with the carbs, I don’t restrict the fats but I don’t fast for 24 hours some days, I fast everyday for 16 hours and eat in an 8 hour period. Since I do that (the same thing) everyday, do you think my metabolism rate will decrease? When you fast intermittently you are not restricting the AMOUNT of your calories by a little bit over the whole day (that is what is meant by calorie restriction); you are restricting the FREQUENCY of your calories. You are Fasting from food instead of dieting. Less frequent eating leads to less insulin spikes throughout the day, which is the premise. You want your insulin levels to remain fairly low, which you can achieve through keto and IF, or EF. Dr Fung, thank you for all the information you provide. It has been very helpful to me. So far, IF and LCHF combined has been the only strategy that has worked for me. However, I have been doing a water fast now for 4 days and have not lost any weight. Do you have any suggestions as to what the cause of this might be. I usually lose about 6 lbs on a 5 day water fast. Thanks. Just to reassure you Birgit, it is impossible to not eat for four days and not lose weight because whilst you are not consuming calories but must burn calories to live you will be losing those calories and so losing weight. It may be that you are retaining more water and so the gain in body fluid is disguising the fat loss. Thank you, Martin. I am on my last (7th) day of fasting this go round. I have now eliminated all artificial sweeteners and reduced my salt intake. As a result, I have lost 2 lbs. Since starting IF with LCHF, I have lost 50 lbs, but have plateaued for the last 3 months. I plan to continue IF by rotating 7 days of water fasting with 2 weeks of alternate day fasting and LCHF. If you were having sweeteners during your fast, then it was not a water fast. Even that small addition can halt weight loss on the scale. Next time, try just water or coffee, tea, and a little broth. The difference is monumental. Thanks a lot Henry. That’s what I am following except No Fruits and No Legumes. I am missing Bread and Rice. Thanks Henry I will experiment if adding legumes would be beneficial for me. God Bless!!! Thanks Birgit. Those are exactly same except Tofu, milk and Lassi. Instead I have boiled and roasted Soya Chunks once in 2-3 days. If anyone could advice that can bread (Flatbread/Chapati of any flour)be added to food or should I forget it forever? For now, avoid all grains. When your health has recovered, you might try to experiment with incorporating limited amounts. The Diet Doctor has a number of recipes for low carb Bread. I have not tried any, but the pictures look good. When one can say his health is recovered? My RBS dangle around 150 mg/dl(without any diabetic medicine). No visual FAT on body anymore. Any suggestion? I am DT2 for past 15 years. Started the 24 hrs fasting with only non-caloric stuff, water, diet ice tea, tea etc. I am on Metformin 1000 twice a day and Junevia once a day. Both of them are extended release. My concern is that If I an not eating anything for 24 hours, taking medicine may cause my blood sugar to go very down. Can anybody please please answer one simple question? Should I take my daily medicine while fasting? So are the results as good if you do a daily 16-hour fast, instead of a 24-hour fast 2 days a week? I would also like to know this. Or an 18/6, which is what I do every day. FWIW, I am a 32 year old female, 5’6″ tall, 135 lbs. The precise details of the benefits of relative fasting schedules don’t seem well-documented at all. Right now scientists are just measuring fasting versus continuous eating, not type I fasting versus type II fasting. IMO, just do whatever fits your schedule. I do personally assume that longer fasts yield additional benefits, but they’re heard to schedule. I agree. we are all different, and summer me is different from winter me. In summer I can go 36, do not even notice it. In winter I get cranky at around 20 or even 16 hours, and sometimes I just do a fat fast, where I eat a couple tbsp of ghee or coconut oil at 10am and 2pm (going dinner to dinner). I have been doing 16-18 hours daily fasting for almost 2 years now with GREAT results. I eat 2 times a day: i break my fast (after a fasted workout) around 2 PM and i eat dinner at 7-8 PM (and some fruit snacking in between) and then i fast again from 8 PM to 2 PM. I feel great, i have low bodyfat percentage and i am pretty athletic (due to strength training), no muscle loss, no hunger etc… so from my own experience i can surely tell that 16-18 hours daily fasting works great. Are you on caloric restriction? Do you count how many fat/carbs/proteins you eat? I’ve started in a few days and not counting at all, just want to know if it’s useless in this way. Anyway I work out twice a week, bodyweight exercise. Is there a practical way yet to measure insulin instead of blood glucose as was done in the two studies you mention? I’d love to be able to see what was happening on the insulin front in my body . Yes. Any medical laboratory can test your insulin levels. Your doctor can fill in a test requisition form for you, and a phlebotomist can draw your blood. This all may cost you money. You are so right. We are on our own and under continouous attack from the system to return to be cash cow again. That’s not going to work anymore when we have all this information thanks to Fung and so many others. Thank you Dr Fung! You are my health hero! I am so thankful for your work! I need to remember that with fasting, even when I am not loosing weight I am still healing my body. I have lost 30lbs this year thanks to you. Its very slow going but its going and not coming back. One simple check is fasting blood sugar morning after eating days. If over 100 you are probably eating too much protein, that converts to blood sugar. Longer fasting times will also help. OMG: “success is as rare as humility in a grizzly bear.” You are one funny and creative dude, Jason. Thanks Dr Fung for your wonderful posts. Not only do I learn, I laugh out loud! Fantastic! Check out the Fung Shweigh group on Facebook as a support tool. Chris, the food given to diabetic patients must constitute cruel and unusual punishment. Complete madness. Well done on your choices and progress. Excellent read. Favorite laugh, “Goodbye reunion show.” Thanks for all you do. What is IER and CER? I spent 10 minutes looking for an explanation and ended up having to trust the implication of the text compared with the graph. I am not sure I fully understand. Let’s say I follow a 23/1 fasting protocol everyday, but also restrict my calories to a 40%-50% deficit everyday. Also, my only meal of the day is very low carb, high fat (keto). Will I slow my metabolism down over time? No, because any energy you need can come from stored body fats once you deplete your glucose as fuel, metabolism has no reason to slow down. Thank you, that’s what I thought I had understood. I feel great and my energy level is very high! Pete and Michele, it’s exactly my case I put my doubt in the first post. Thank you! Agree, it is perfect at least to start. If weight loss stalls after a while reduce proteins. Check out Jimmy Moore and Ron Rosedale for more about it. I echo this question. Having read every word that Dr. Fung has written, I still don’t know the answer. I suspect that total calorie intake doesn’t matter, but I would still like a definitive answer from Dr. Fung on this topic. Did you find the answer yet? I have read Dr. Fungs book too and seen a lot of his videos and also read this article and this still elludes me. Your metabolism will NOT slow down after a substantial calorie reduction unless your insulin level is also high. Insulin controls the release of fat. Fasting with HFLC combined with a narrow eating window ensures that insulin stays low so your body can use fat as it fallback energy source. When fat can’t be used, the body’s only other choice is to reduce your energy output by putting the brakes on your metabolism. So are you suggesting that when people go an a calorie restriction diet, what they are actually doing wrong is that they eat e.g. 3 small meals a day and some fruit in between? And if they would be eating exactly the same reduced calories but only in one single daily meal, this is what would make the actual difference? Yes, that is what this fasting thing is all about, the time you are NOT eating, gives your body a chance to do other stuff than store energy. So what I get out of this is that daily caloric restriction is CRAP. Is Caloric Restriction as Primary really the official term? Did the geniuses who came up with this bother to read their oh so clever acronym? Thanks Dr Fung, I learn a lot from you and the humour makes the points stick. Part of Dr. Fung’s witty style. He (as far as I know) chose the acronym deliberately for comic relief reasons. And the alternative theory he proposed, Hormonal Obesity Theory is…yes, it’s HOT. My question about all this intermittent fasting is: Is IF beneficial if you are not doing the low carb diet as well? I eat gluten free, but I do eat fruit and sometimes small amounts of grains. About 100 grams of carbs a day. Would intermittent fasting benefit me, or would it just stress out my body since I am not keto adapted? Thanks for any insights! Bre, I started by changing to a low carb, high fat diet and found that I was easily and naturally going 12 – 14 hours without eating because eating a higher fat diet satisfied my appetite. I later moved easily into fasting because it was easy to add another 2 – 5 hours on top. So, fasting benefits anyone, but a diet that doesn’t make you feel hungry obviously makes fasting a lot easier. Fasting seems to work no matter WHAT your starting point–I have a girlfriend who is hopelessly wed to the SAD diet, so I turned her onto intermittent fasting instead of the continued uphill battle to try to clean up her diet. In spite of eating SADly, she has lost weight, and her blood sugars have improved. I imagine the lack of stress from me trying to correct her diet also played a role. She’s continuing to lose weight and improve as we speak, despite all the junk foods she eats. GO FASTING!!! It’s not that hard to dodge refine carbs. Sounds like you’re just making excuses. Raj, Next time drink more water, it helps. If you eat less carbs and more fat for a few days before you start next fast you may not feel weak after 40 hours time as you have already adapted the body to burn more fat than usual. Fasting gradually becomes “pure” fat burning, once (diabetic) stores of glycogen and liver fats and ARE GONE AND proteins scavenged by autophagy has been used up. With LCHF as starting point you really get a flying fast start! Same fuel (fats) but from different sources. Wish you the best of Luck! Just discovered there is a study result posted as table 3 in Dr. Jason article of 1 May 2015 (Fasting 4). The subjects’ average glucose on day 2 exactly same as what I observed in my case! Sorry the name got auto corrected, I didn’t notice! Yes my main concern was if I had not eaten the sugar level was low enough to cause some serious trouble such as fainting. I think I can stretch myself bit more next time. I am not vegetarian but not much of fats in my diet right now. I’ll keep your comments in mind. 84 hours seems like long long time impressed you pulled it off! Thank you very much for the reply. Then I will continue with my fasting schedule. I just wondered whether my deficit was too large. I feel good and I love to fast on consecutive days. I’ve been doing this for some months now (more for health reasons than weight loss) and I didn’t want to change to some other schedule. I need to correct something there: of course I want to lower my body fat percentage… Sorry about that. I no longer aim for ketosis, I stick to LCHF because it is so great not to be tempted by sweets and junk food. Its like my body works the way its supposed to. But the after-fast fatigue is bad. Another week past by, and its still bad…. Absolutely epic post Jason! My clients ask me all the time about “stavation mode”. I’ll point them here. 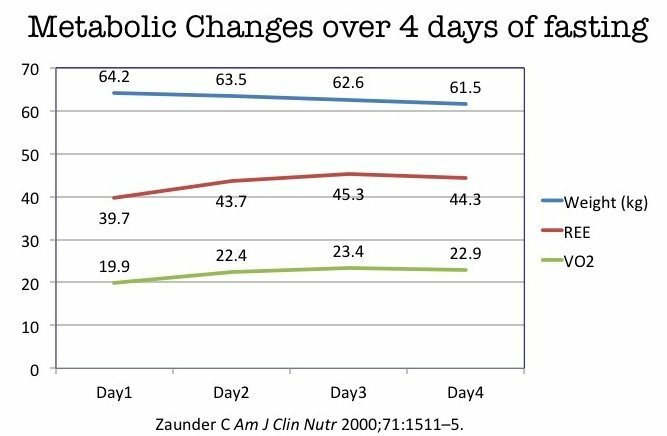 Btw, the “Zauder” 2000 study on your “Metabolic changes over 4 days of fasting” image should read “Zauner” (with an N) unless I’m mistaken. Even more interesting is the effect of prolong fasting with correct refeeding. I really missed this week’s blog . I also miss his comments. Really good article. Thx for the same. My Qs is, during fasting, the uric acid level is increased and body will be getting into ketosis mode. Can the person who is having high uric acid level, follow the intermittent fasting? Thanks for the great post Dr Fung. One question I have is in regard to the increased metabolic rate that fasting produces. Have any studies been done to see how long the body maintains this increase? Reduced calorie diets decrease metabolic rate even up to six years. But I have seen nothing about how long the increased metabolic rate continues. Thanks! The trick is to incur negative energy expenditure without decreasing TEE that would negate it. So if your goal is to lose body fat and not maintain or gain, you could still use a calorie deficit when refeeding. Since the body cannot access more than around 31.4 +- 3 calories per pound of fat per day under non-fasting SAD conditions, I would target a deficit no larger so TEE won’t be decreased. I’ve followed your advice, and my bloodsucker has improved, but ! I’ve been intermittent fasting i 4 weeks, and I’ve cut out all carbs and sugar, but it seems like my sugar storage is unlimited? How long does it take to get rid of it? I’m not taking medication, but I do take Gymnema, Chromium and Cinnamon that is working to a certain extend. Thank you for all your information/education, is it desperately needed ! I’m Danish, and you won’t believe what the Danish diabetes association is recommending to eat, it’s sick ..
I’ve been following this blog and the YouTube videos. I started with fasting blood sugars of 225 and am now regularly around 85 mg/dL. Last week I tried going from alternate day fasting to a 3 day fast. My blood pressure went up and my sugar on day two was 63. Is this common? What could be causing that? I meet with my doctor to get my A1C re-checked this week. It would be great to have any insight on this issue. First off, I love your material! I have read the latest book, and am catching up on your blog posts now. Your data makes more sense, but wanted to see what you think.